Bhimkhand is one of the major tourist spot in Angul. A rock art sleeping image of lord Bishnu is located at Bhimkand, village on the right bank of river Brahmani. Now it is situated with the complex of the largest coal based super Thermal power plant at NTPC. The image sleeps on its right side is about 42 ft long and 8 ft wide. The image is the second largest image in India. This place is about 5km from N H 23. 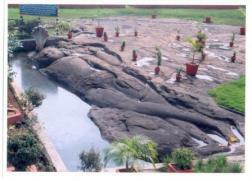 Give Responses for "Bhimkhand Sleeping Bishnu | Tourist Places in Angul"